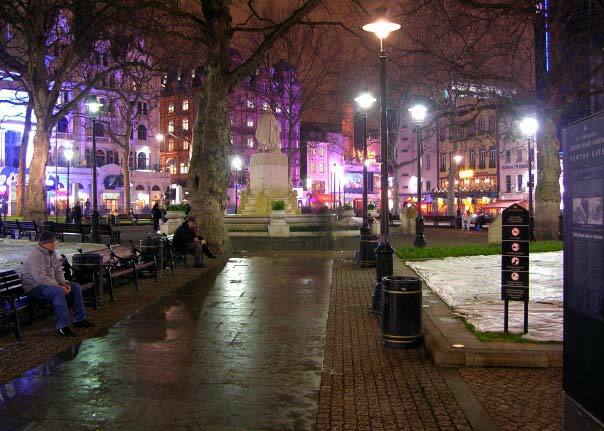 Leicester Square is a courtyard in London. It is popular with tourists due to its close proximity to London’s West End. This area houses numerous theaters, Chinatown and Trafalgar Square. The square is relatively small. Its benches are packed with tourists who are taking a break from exploring London’s West End. Leicester Square hosts the majority of British movie premieres. Due to this, the square is surrounded by expensive cinemas. Film buffs who want to see a movie at a Leicester Square cinema should be prepared to pay at least 15 pounds for the experience. In the evenings, the square becomes extremely busy. The crowds in the area are made up of both tourists and locals. Many of the visitors spend their time at surrounding nightclubs and bars. The northwest corner is close to the Swiss Centre. This building is now home to a popular nightclub called Sound. What makes this club unique is that it has a carillion which depicts Swiss scenery. The cheapest way to get to the square is to take the tube. The area is close to a train station that has the same name. The train station is located in an area that is a close to most West End attractions. Once there, tourists can explore the area by foot. As previously stated, Leicester Square is a simple courtyard and garden. The reason it is so famous is due to its prime location. Some nearby attractions that tourists may be interested in include Chinatown, Trafalgar Square, The Edith Cavell Memorial, The National Gallery, Picadilly Circus and the West End.